What better way to help people understand the joy of adoption but to hear it from the mouths of those who have adopted. This space is reserved for Westie Rescue Michigan adopters to tell their success stories and share photos of their adopted Westies. Butch came into our home 2 years ago. We started out being his foster home. He was our 3rd foster dog that year. Butch was given up by his family because he didn’t get along with the age 3 and 18 month year old boys. Butch was 5 1/2 years old when he came into rescue. We did not plan to add another dog to our family, but Butch fit in so well with our 8 year old Westie, Riley, that he stayed. Butch did not like to be picked up, hugged or held when we first got him. We think it was because the toddlers he lived with were not very nice to him. After allowing him some space and letting him know he was safe with us, Butch is now a very loving dog. And he loves our grandchildren, who are taught how to love and respect a dog. We are very happy to have Butch in our lives and Riley loves having a brother. Nothing is better than a testimonial from a happy customer ! 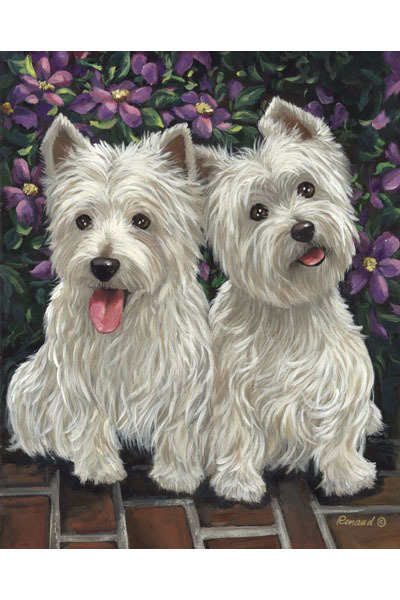 We have had three other westie’s in our family – Reggie, Murphy, and Mcgyver . We lost Mcgyver last June and it took a while to come to terms in getting another dog. Murphy, his 11 year old ” brother”, made our decision easier since it became apparent he just needed some canine companionship and we soon found out, so did we. Spencer- a 6 yr old, was adopted thru the west highland terrier rescue. We found the group extremely organized and professional. Spencer is now part of our family and a true companion to Murphy. We could not be happier with the transition. If you are looking for a Westie we highly recommend a rescue dog – use the website to fill out an application. Sweet Petey came into foster care at the age of 12 and we soon discovered a serious medical condition called “Westie Lung Disease”. We knew that he was unlikely to find a forever home and his foster mom agreed to make him her permanent foster and she would “walk him home”. We are all surprised at how long he has lived. His lungs are progressively worse but Petey’s life has been well worth living. While he isn’t technically adopted, his mom considers him to be “her boy”. Following is a story which shows how much even these older dogs benefit the humans they are with. Earlier this summer we moved my 95-year-old grandma to an assisted living facility. Petey was used to visiting her every Sunday before she moved, so he now visits her at her new “home” and has become the “therapy dog” for the residents. He didn’t do much “therapy” on his first visit. It was hot outside and Grandma’s room was much warmer than what he was used to. We almost had to leave until he found a comfortable spot to cool off. Another time he went to visit and he caused so much commotion because everyone wanted to find that “little white puppy” and visit him. The aides told the residents where he was and there was a line of wheelchairs outside Grandma’s room waiting to see Petey. 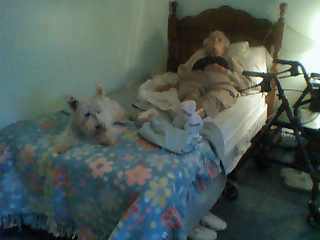 The photo is of Grandma and Petey resting in between a wave of visitors. Jake came to Rescue as a very young and very sick puppy (See photo album for 2005). He has become a very active little Westie boy. He has titles in Agility, Obedience, Earthdog, Rally and Flyball. He is working on Tracking and Treibball currently. We’d like to share this short clip of him in a recent Flyball tournament. It was held at the Dinovite facility in Crittenden, Ky. Many people believe that Westies cannot be trained. We are here to tell you that they can be trained and can do well. Just look at this boy fly!